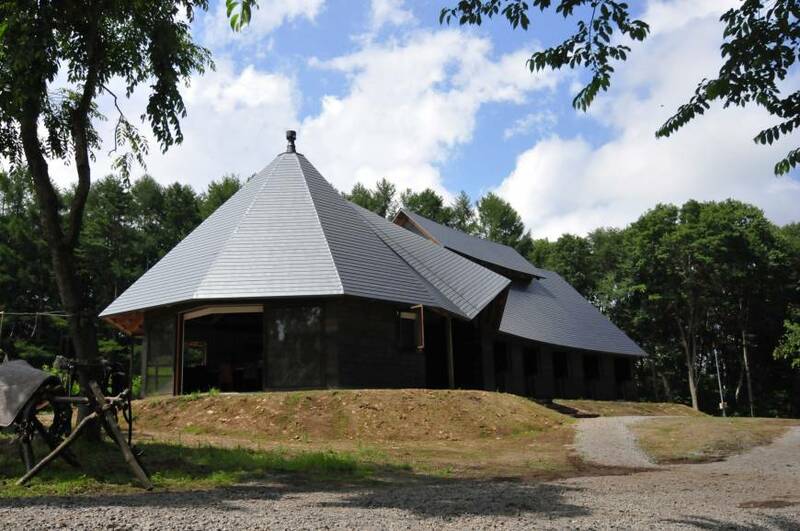 On July 15, 2016, just a few minutes’ gentle canter from our splendid Afan Trust Centre here in the hills outside Kurohime in northern Nagano Prefecture, we officially opened our brand-new, first-ever horse lodge. 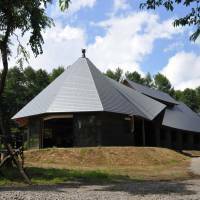 Designed by Nobuaki Furuya and his team at Waseda University in Tokyo, the lodge has stalls in which we can stable five horses, a grooming room with a shower to get them cleaned up, a tackle room and storeroom. There’s also a large, pleasantly airy, pentagonal-shaped “clubroom” with a log stove, simple cooking facilities and — of course — a bar. Most of the furniture was designed and created by the Yokohama-based Okamura Corp., using quality hardwood timber extracted by horses from our adjacent Afan Woodland Trust woodlands and from forests in the Minami Aizu district of central Fukushima Prefecture. The Japanese cedar logs used to make the stout wooden walls between the horse stalls were also hauled out by horses. In fact, the whole building is constructed from Japanese timber. On my watch, the trust will not use imported timber. Why should we? Some 79 percent of Nagano Prefecture is covered with mixed forests, woodland and tree plantations — nearly all of it badly in need of trimming and wise management. In Wales, when I was growing up in the 1940s and ’50s, there were horses all around. Without any supervision I started clambering onto the backs of half-wild Welsh ponies when I was 8, and it wasn’t until I was 12 that I actually got to ride a horse with a saddle. Apart from being used for recreational riding, racing, fox hunting and perhaps polo, the horses mostly drew coal, beer and milk wagons, and in hilly Wales it wasn’t until the 1950s that tractors began to replace them for farm work. But anyhow, horses were definitely an integral part of the rural scenery and culture in Britain back then — as they still were when I first came to Japan in the early 1960s. Most of my life here has been spent in the countryside, and it’s been a grand life. I’ve been able to keep dogs, cats, chickens and rabbits, but there was also an empty space in my heart: I missed having horses around. For a long time now I’ve been convinced that the best way to extract selected logs from woodland that’s home to a delicate and precious diversity of wildlife is to use horses, because their hooves don’t compact the ground the way heavy machinery does. Also, you don’t have to construct expensive and environmentally damaging logging roads if you use horses. In Japan, with a combination of human effort and horses’ power, it’s normally quite easy to take logs out to an existing narrow road or a track just wide enough for one of those mini pickup trucks that are easily the most widely used vehicles in the countryside nationwide. Despite that, better still for causing minimal damage while hauling logs along narrow mud, gravel or woodchip tracks leading to roads suitable for large logging trucks, or to open areas where the logs can be milled into beams and planks, is a horse-drawn log-forwarder — a highly maneuverable, six- or eight-wheel low cart specially designed for the job. It was in Britain that I first met the man who gave me the most hope, advice and inspiration to act on my dream of bringing working horses back to the culture and scenery of rural Japan. His name was Doug Joiner, a full-time horse-logger who sadly died on Sept. 8, 2014. 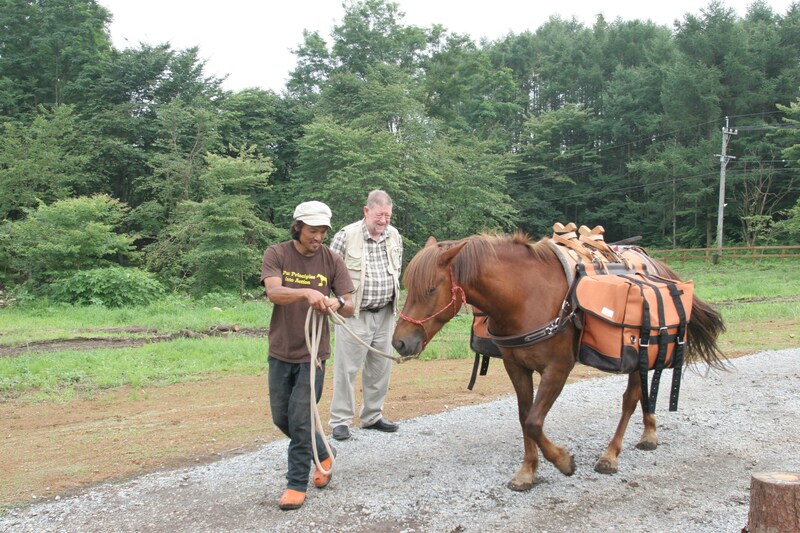 Doug, who was chairman of British Horse Loggers, the industry’s trade association, came to visit our Afan woods in Nagano, as well as horse-logging operations in Tono, Iwate Prefecture. 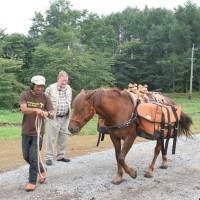 He was also the guest speaker at a Tokyo seminar on working horses in the countryside. Before that, Doug had more than once welcomed two young Japanese horse-loggers, Ken Hachimaru and Takashi Iwama, to his workplace and home in Childer Wood, near Ledbury in Herefordshire. Those two have since become friends of mine, with Ken-san taking over the acquisition and initial training of our first two horses, Chacha Maru and Yuki Maru. To honor the memory of Doug, who was only 60 when he passed away, we named our new horse lodge The Doug Joiner Kurohime Horse Lodge. We were delighted that his son, Matthew, came all the way from Britain to be with us during three days of exhibitions, receptions and parties we held on July 15, 16 and 17. So, we now have the horses, the paddocks and the lodge. This is the start of a whole new adventure for our staff and myself. With so much of Nagano Prefecture forested, and despite so many trails now being so long neglected, I want to be able to take selected visitors unencumbered by rucksacks or other burdens on treks deep into the mountains, with horses carrying the gear and supplies as they walk along with them. In the 1960s, I became the first game warden of the Simien Mountains in Ethiopia, where I was instrumental in setting up the 220-square-kilometer Simien Mountains National Park in 1969, at a time when all transport was either on foot, or by horse, mule or donkey. That experience taught me it is eminently possible to have adventurous but comfortable and safe camping experiences in areas unreachable by motorized vehicles — as long as you do it properly and don’t go off half-cocked. Horses and humans have to train together, but we humans must think first for the horses because steep, wooded slopes, valleys and ridges are not their natural environment. For example, we can’t operate in the mountains here during the hot, humid weeks of midsummer because of huge, persistently biting horse flies. In winter, however, with adaptations and preparations we might be able to use sleds — though snow can settle to a depth of 80 centimeters overnight. Actually, there seems to be more to be concerned about surrounding this project than there was for any of the 15 Arctic expeditions I managed to pack away in a former life. On the other hand, unlike in the mountains of Ethiopia, we have GPS — and we don’t have to worry about bandits or armed poachers. For sure, this will all prove to be an even more challenging and busy way of life for my staff and myself — but one that promises to be enormously enjoyable and satisfying, too. If you are interested in taking part in this adventure as a working horse expert or as an intern, please send details (in English or Japanese) to the C.W. Nicol Afan Woodland Trust at info@afan.or.jp. Sorry, but we can’t accept people with tourist visas and, until I say so, nobody will be riding any horses.